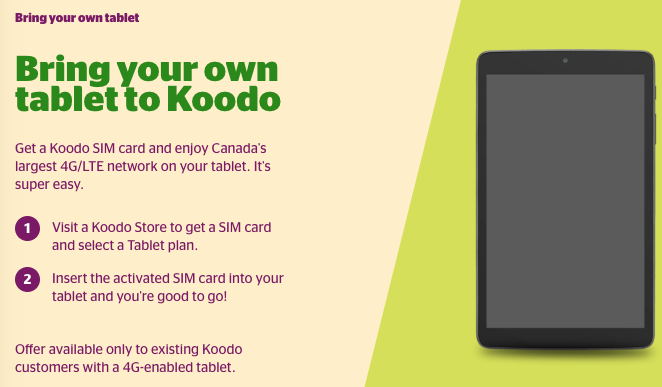 Telus flanker brand, Koodo Mobile, has launched bring your own tablet plans for existing postpaid customers. Currently, signing up for this new BYOD tablet plan is only available in-store (online coming soon) for now, which means a $30 connection fee applies. There is a base plan which is $15 per month with 3GB of data with Shock-Free data SMS alerts, when data limits are reached, unfortunately, these won’t be received on non-SMS enabled devices such as Apple’s cellular iPads, says Koodo. However, Apple customers will see their data paused once they reach their limit, and other alerts (such as via phone or email) will be sent if setup. Extra data is billed at $7 per 100MB, or $70 per gigabyte. Customers with Apple iPads will need to manually configure their APN settings according to Koodo to get set up. Koodo says multiple tablets are allowed per account and these BYOD plans means there won’t be any Tab charges, since you’ll be providing your own tablet. Rogers-owned Fido has long had a $15 tablet plan with 3GB of data, and now Koodo finally joins the game too. However, Fido data overages are charged at $10 per gigabyte, compared to $70 per gigabyte at Koodo. Let us know if you’ll be signing up for this. It’ll be interesting to see if Koodo starts selling tablets soon as well–maybe they’re preparing for new iPads possibly coming soon?